I live in a studio. So space is (very) limited. When I moved from my cottage-like 2-bdrm abode in spacious Florida to the 7×7 mile peninsula that is San Francisco, a lot of stuff had to go. It’s amazing just how much crap one can accumulate when you have the available space. And once in San Francisco, I begrudgingly made yet another trip to the Salvation Army when I realized that my initial clean-up was not sufficient for my new living space. Downsizing was initially stressful. After signing the lease on my little home, I walked into the space with pangs of anxiety and claustrophobia. How is all my stuff going to fit in here?? What else can I get rid of? This is NEVER going to work!! It took some conscious deep breathing and a reassuring pep-talk with myself to get my heart rate down. But after some meticulously planned placement of furniture with a measuring tape, things fell into place (literally). And my living space became tight but tolerable, until this past weekend, when a bubbling angst over space signaled that yet another clean-up was necessary. The bookshelf that was stuffed into my closet had items I hadn’t looked at since I moved; extra stools took up valuable overhead space; my photography lights, also unopened since the move, took up more space than their practical value to me. 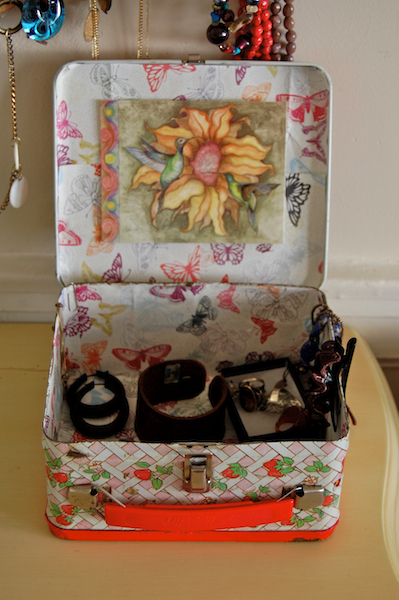 What started as a mere reorganization of a few items turned into an entire reevaluation of all material possessions. Old card from an ex? Out. Clunky backpack? Goodwill. Fiction books I won’t read again? In the clunky backpack going to Goodwill. While I have experienced the therapeutic qualities of cleaning house before, no clean-up had ever felt so good. I can’t quite say why. Maybe it’s because it was not done in a mad rush to move apartments. I had no time-limit, no urgent reason that prompted it, and no expectations for what I was trying to achieve. The intent was simple: purge that which does not serve me. And in that pure mindspace, I found that I was able to be fully present with each object I sifted through, appreciating it for what it was and easily able to make a decision on its fate. There were no struggling moments of indecision or exasperation. 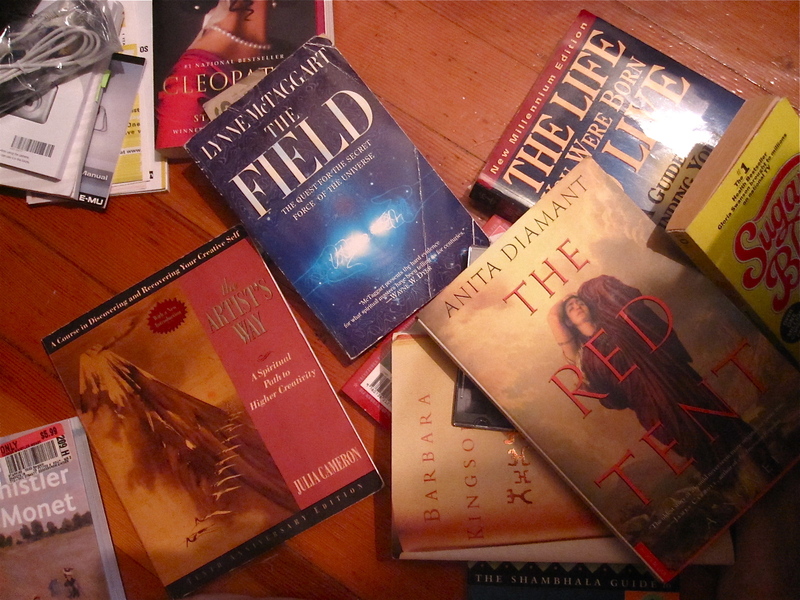 In that state of presence, I found creative inspiration coming in to help with my purging process. I considered finally getting rid of my metal strawberry shortcake lunchbox that had been my companion since kindergarten. It even accompanied me to my first professional job post college, earning me the nickname “cupcake.” At the decisive moment, while standing over a scattering of books and albums on the closet floor, I realized that I could line the box, covering the rust lines, and have it neatly house the jewelry that overflowed my night table. In fact, a large piece of beautiful butterfly wrapping paper I saved from a “welcome to San Francisco” present was still neatly folded under a pile of books, waiting to be used. This idea would be its saving grace from the trash. And so my craft project began. Here is the end result. Once the bookshelf was reorganized and I was reacquainted with all items that filled it, I moved on to my clothing rack. 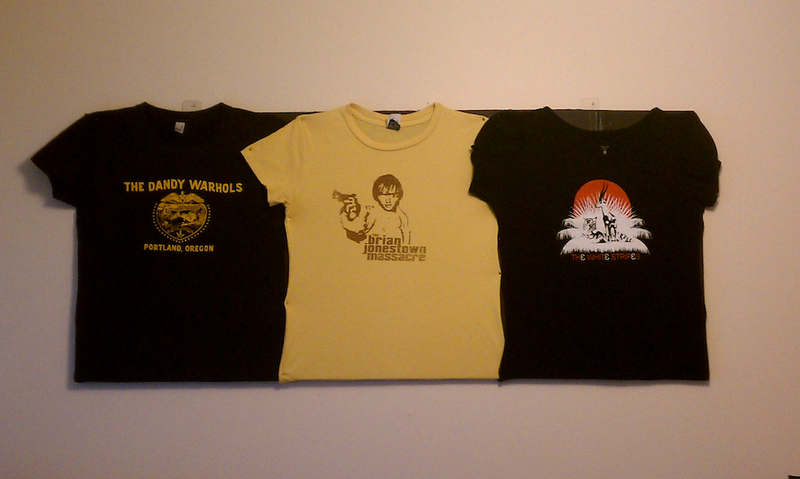 Doing a quick sweep for unused garments, I came across several band t-shirts, shrunken from loyal overuse. I loved these shirts, but they were too short to wear. I recalled the t-shirt display that covered the front of the GAP office downtown, and I knew what to do. An uninspiring Target canvas print, brought over from my FL days, hung on my large kitchen wall. It was time for a change. By the end of my cleaning rampage, I noticed that I could breathe easier. I felt renewed and energized. And my living space no longer felt cramped, but just right. Not only could I now recall what items I owned and why, but valuable space was created through my careful elimination and recycling (upcycling?). I then realized that something is not better than nothing, and available space should not be a reason to fill it. Both in my closet and in my life I noticed a tendency to horde, to claim and hold on to things available to me, simply because I can – without thoughtful consideration of how they actually serve me. In my quiet moment of contentment, while taking in my fresh surroundings, I vowed to respect my space going forward by filling it only with those things that add real value to my life.